- Measures: Width: 150 cm Depth: 056 cm Height: 205 cm Weight: 1200 Kg - 2 years Guarantee! - Free Shipping! The sink can be on the left side or on the right side of the Barbecue and it can also be changed. The price keeps the same! 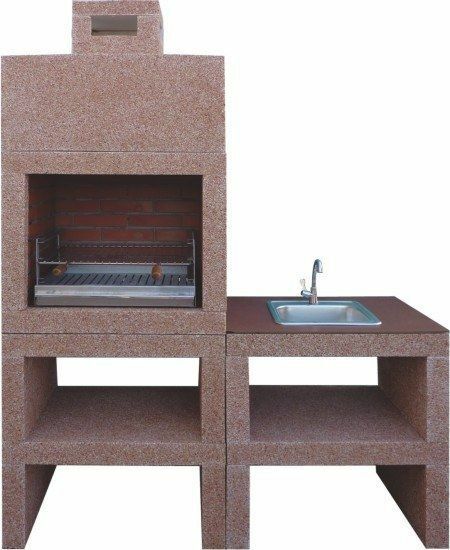 Modern Barbecue with Sink AV851F. Free shipping to England, metropolitan France*, Monaco, Belgium, Luxembourg, Italy and Spain. For other destinations please contact us. Fresh herbs make all the difference in this light, summery bean salad that in turn makes an aromatic bed for the easy grilled shrimp. The shrimp and salad are wonderful together but you could also make them separately. Consider skewering and grilling scallops as another delicious option. 1. Combine lemon zest, lemon juice, oil, oregano, sage, chives, pepper and salt in a large bowl. Reserve 2 tablespoons of the dressing in a small bowl. Add beans, tomatoes and celery to the large bowl; toss well. 2. Preheat grill to medium-high or place a grill pan over medium-high heat until hot. 4. Oil the grill rack (see Tip, page 5) or the grill pan. Grill the shrimp until pink and firm, turning once, about 4 minutes total. Serve the shrimp on the white bean salad, drizzled with the reserved dressing.